This recipe takes no extra effort to create as a pureed meal from its original and can be made on the same day as no freezing is required. Sweat onions with 60g butter in a large pan, add fish and cook through, then stir through KNORR Garde d'Or Hollandaise Sauce. Remove from heat, cool slightly, then puree in a blender. Place in individual pie dishes. Boil water, remove from heat and whisk in CONTINENTAL Professional Instant Mashed Potato Mix, until smooth. Add remaining butter and spoon over the fish mixture. Bake at 180 degree Celsius for 15 minutes until potato topping in golden. 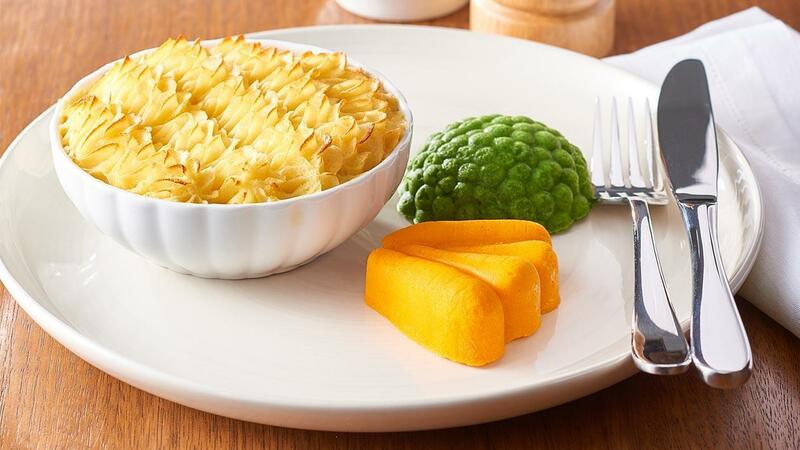 Serve with pureed carrots and peas shaped in their respective moulds. To avoid skin forming on the mash during reheating of dishes, simply cover with foil.